Four Poster road simulators are the workhorse of the simulator family. Inputs are tire-coupled, meaning that they are applied to the vehicle in the same way they are on the road. 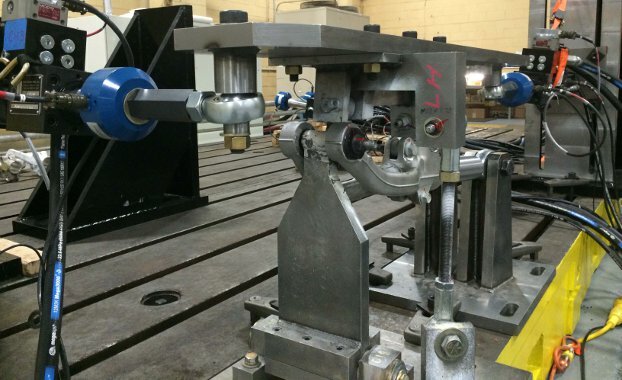 This results in very accurate boundary conditions and makes them ideally suited to NVH. Ride, and Squeak and Rattle evaluations. They are also used for End-of-Line testing, and structural testing of the vehicle chassis early on in the vehicle development process. Shore Western’s Four Posters use RTAC to accurately reproduce sinusoidal and time history excitations. 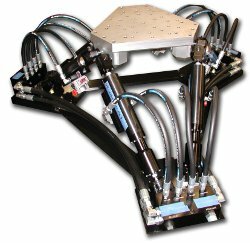 We manufacture vibration tables in either the Stewart Platform configuration (shown), or the classical MAST (3-2-1) configuration in sizes suitable for small applications (such as engine ancillary components), to large sizes for vibration testing of items such as truck cooling modules. We have also built tables with very high angle capability to test seats for off-road applications. Vibration tables are used for Squeak and Rattle, and durability of mounts for engines, engine accessories, radiators etc. They are also used for testing items such as seats, instrument panels, lights.